We have carved a niche amongst the most dominant names in this domain, engaged in offering Digital Board Menu Sign. - They say a picture speaks a thousand words. Similarly, GRAB Productions depicts aesthetic and appealing designs that capture the attention of your target audience. A mesmerizing mix of High-End tecnology, visuals and colours make your Brands and Services stand out in the clutter. • LCD display with HDMI videos. 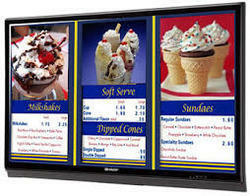 We are instrumental in manufacturing LED Menu boards which can be installed in Restaurants, cafes, pubs etc. We offer extensive range of menu stands in stainless steel which form the most vital part of buffet systems. Having rich expertise in this domain, we have been able to bring forth an unmatched array of Menu Signs. Justifying our reputation in this market, we are immersed in the arena of offering to our patrons a broad consignment of Restaurant LED Menu Board. · Slim LED box 10mm Thickness. (look likes LED TV). · Graphic to be change by customer itself.